Everyone giving to charity wants to know that they are giving in the most effective way possible. Charitable giving should add more value than just the £$. There are no die-hard rules here though, and I stress that because I don't believe in rules! What works for one person and one charity may not (and probably won't) work for all. In this space we'll be examining and trying out some of the latest techniques for giving more effectively so that you can choose what works for you... from place-based giving to matched giving and tax-efficient giving. Commissioned by the Office for Civil Society (DCMS) this is the largest study of place-based schemes in the UK to date. Place-based giving is one of the exciting new ways being used to tackle local needs with support from local people, grant-making trusts and companies. Southwark has the highest rates of childhood obesity in the UK, coupled with high poverty and overcrowding; yet it also enjoys huge wealth in some areas, leading to massive differences in life chances between neighbourhoods. While Southwark celebrates its high diversity, the community is becoming fractured and displaced due to gentrification. This report provides the groundwork for Southwark Giving, evidencing the local needs and illustrating issues which local people and charities feel are priorities for further support in the fragile recovery period following the global recession. Southwark Giving follows the groundbreaking work of Islington Giving and Hackney Giving and is the latest London placed-based giving scheme to find new ways to address hidden, unmet and emerging local community needs. Community Southwark, the umbrella body for charities and community organisations in Southwark, commissioned this research, with funding from United St. Saviour's Charity, Team London Bridge, Wakefield & Tetley Trust and City Bridge Trust. This executive summary presages a more detailed full report on Southwark's needs (out in March 2017). Tax-efficient giving - worth the bother? 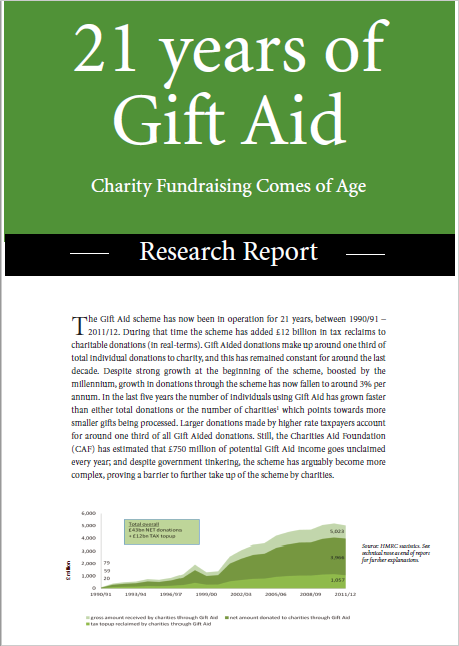 The Gift Aid scheme has been in operation for 21 years. Find out how much it has raised, how widely it is used and what the future holds in this comprehensive report (with Foreword by Charity Finance Group CEO Caron Bradshaw). Match-funding is when an employer, the government or philanthropic body matches a charitable donation – usually pound for pound. More people are likely to donate to charity and give more money if they know their donation will be match-funded. Commissioned by innovative giving enabler: The Big Give, donation management experts: Charities Trust and CSR giant : RBS this report examines match-funding's efficacy in charitable appeals, payroll giving and product donation. The research report, "A Great Match”, analysed data from 138,000 charitable donations, and is the first-ever in depth research carried out into match-funding in the UK. The headline results show that donors gave 2.5 times more to charity on average when match-funded. The average value of a matched donation was £333 compared with only £132 for those which were un-matched. As an Economic Psychologist Cat's view of the Budget 2012 proposal to put a cap on income tax reliefs for higher rate taxpayers, and including charitable tax reliefs, was that it was an unmitigated disaster for the Chancellor and the Government, but not necessarily for the reasons you might think. This paper explores why that is.